Last night, current Good As Gould Goalie and York High School Sophomore Thomas Wesolowski stopped 31 of 33 shots to lead the York Dukes Varsity team to a stunning 5-2 victory over current no. 1 in state New Trier Green in Game 1 of their best-of-3 league semi-final series. This is the first time York has beaten New Trier Green in recent history. Game 2 of the series is tonight, February 22nd, 7:10pm at Addison Ice Arena. The entire Good As Gould Family congratulates Thomas and the York Dukes on their big win and wishes them the best of luck in the rest of league and sate playoffs. Like most hockey players, Steve Richmond doesn't stand up as straight as he once did. Maybe it's the cumulative effect of a lifetime spent trying to get to the Stanley Cup Final, one that makes a man look like he's been carrying the weight of the world on his back for 40 years. Or maybe it's just a bad back, the result of a lifetime spent playing, fighting, coaching and traveling, the last 16 of those years surviving so many heartbreaks as the Washington Capitals' director of player development. But now the 58-year-old Chicago native is within four victories of the party he's been envisioning since before his days at Evanston High School. "I've been dreaming about it since I was a little kid," said Richmond, a longtime Lake Zurich resident. "All the years in juniors, college, the minors, the NHL … it's all you think about, holding the Cup." "It seems surreal that now we're this close and it's possible." Richmond was one of the first really good players to come out of a 1970s Chicago-area hockey program and after two years of junior hockey in Pickering, Ontario, Richmond set a record for goals by a defenseman at the University of Michigan. Signed as a free agent by the New York Rangers in 1982, Richmond played 159 NHL games for four teams in the '80s, managing 27 points and a ridiculous 514 penalty minutes. Yup, Steve Richmond would fight anyone. Actually, he would probably drop 'em now if you proposed in proper fashion. After his last pro season in 1991 with the San Diego Gulls, Richmond went about the business of raising a family with wife Jeanne, herself a basketball and track star at Michigan. That's when a twist of fate hit Richmond with a right cross. He was coaching and directing the Glenview Stars hockey program in the late '90s when they ran into a Park Ridge team coached by former Hawks defenseman Bob Murray, who was working in the Hawks' front office. "He was coaching his son and I was coaching mine, and the game got a little heated," Richmond said. "He was sending out kids to go after my guys and I wanted to fight him. "I was looking for him behind the benches after the game and I was ready to kill him when he comes up to me and says, 'Hey, you ever think of getting back in the game? You should be scouting for us.' "So I went from wanting to fight him -- I mean, I was really mad -- to getting a job. Funny how things happen, huh?" It was less a crossroads than an on-ramp. Murray, the GM in Anaheim the last 10 years, didn't last long as the Hawks' GM -- not with Bob Pulford around -- and Richmond moved on to become the head coach of the Chicago Steel for two years (2000-02), where his son Danny played before also heading to Michigan. It was then that Steve was hired by George McPhee, the GM of the Caps and his former roommate from their days with the Tulsa Oilers. OK, well, that's another story and one that would take an hour to tell you, but suffice it to say that the Central Hockey League team is famous in hockey circles for going bankrupt in 1984, being homeless for the final two months of the season, moving to a hotel in Denver and practicing at a shopping mall where they weren't even allowed to use pucks. Sort of a "Slap Shot" meets "Semi-Pro," only with real-life consequences. That absurd story ended, naturally, with the vagabond Oilers winning the league championship -- played at a practice rink in front of 500 people in Indianapolis -- and the CHL disbanded the next day. "It's worse than it sounds," Richmond laughed. "There was one time we had to buy our own plane tickets back from Birmingham." Richmond reunited with McPhee in Washington and in 2010 as the No. 1 overall seed it looked like Steve might run into Danny in the postseason, but the Caps lost a seven-game series to Montreal in the first round and the Hawks won it all, Danny celebrating on the ice in Philadelphia in street clothes as a member of the Hawks' AHL affiliate. His son has a ring and is still playing professionally in Europe. Steve hopes to now grasp the big trophy as the Caps face the Golden Knights in the Stanley Cup Final beginning Monday night in Vegas. "I was obviously very happy for Danny and really glad the Hawks treated him so well, but it also hurts," Richmond said. "I've seen a lot of friends win and I'm jealous. It's what you play for, why you're in the game. It's why you ride buses and travel all over the world scouting. That's the goal. I'm not doing this for hotel points." And now the Caps will have to go through Vegas, and old friend McPhee, the Vegas GM, to get what they want. "I'd run over him to get a ring, but I'd help him up afterward," Richmond said with only half a chuckle. "It's just amazing because Vegas wasn't supposed to be here and we were supposed to be dead." The Capitals have made the playoffs in 10 of the last 11 years with eight division titles, three of the last nine years as Presidents' Trophy winners, and seven times losing a seven-game series, often to clubs that went far in the postseason. It's has been a glorious, but tortured run in Washington as the franchise reaches the final series of the season for the second time in its 43-year history and first since 1998, as it tries for its first title in a year in which the experts believed the Caps would be rebuilding. It speaks to the difficulty the Caps have had, and how hard it is to win in the postseason, that after so many tough endings they started this year's run against the Blue Jackets in the opening series with two overtime defeats at home. "We played two great games and we're down 0-2," Richmond said. "We got to their place and we're short-handed in overtime and we could be down 0-3, but we get a break and win in double-overtime and suddenly it's a series. It's such a fine line when you're playing great teams. All three of Pittsburgh's Cups, they beat us twice in seven games and once in six. You're not playing the Skokie Flyers. It's tough to win in this league. Sometimes you just get beat by a great team. This year, maybe it's our turn." For a hockey lifer enduring a very long journey, it's the ultimate chance to throw the last punch. Illinois West High School Hockey League will again host a pre-season Goalie clinic for all West goalies at All Seasons Ice Arena. The clinic will be held for four evenings starting Monday, July 23rd through Thursday, July 26th new from 6:40PM - 8:40PM each evening. As begun last year, the clinic will consist of both on-ice and off-ice sessions each evening. 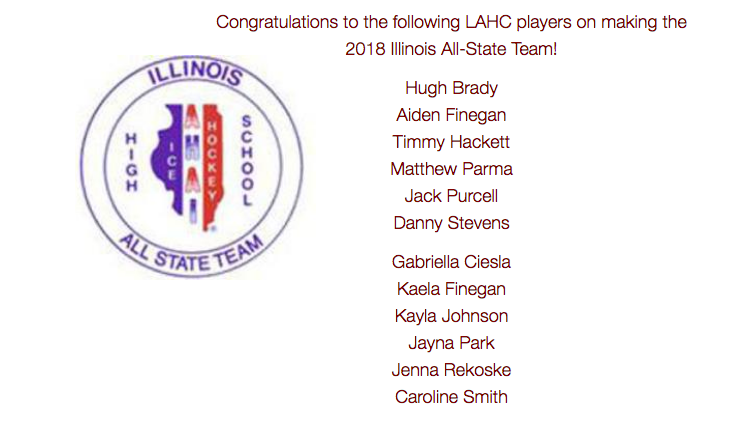 All goalies from Illinois West are allowed to participate. The clinic is provided by the League at no cost to the participants. As is our practice, many of the coaches are past Illinois West goalies who are now playing in the college ranks. Pat Meek from Good as Gould Goalie School will manage the clinic with many experienced coaches to assist at each station. This will be the 9th year the Goalie clinic has been provided by the West. If space allows, West will accept other, non-West, high school goalies to participate at the cost of $300 for the clinic. Please send your sign up request to bkmeek@usermail.com. Our member teams participate by providing shooters each evening allowing the on-ice coaches to work directly with the goalies. The clinics have been extremely successful and the goalies consistently request that we hold the clinic each summer. Goalies who participate head into fall tryouts confident and ready to go. We look forward to another fantastic clinic this summer and a great 2018-2019 high school hockey season. Senior Hugh Brady has come a long way since being cut from Loyola’s JV team as a freshman. 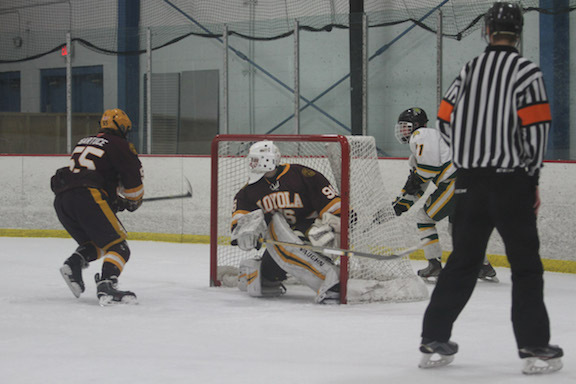 In his first season with Loyola Gold, Brady will be the team’s starting goalie when the Ramblers open the Scholastic Hockey League finals Friday against New Trier Green at Heartland Ice Arena in Lincolnwood. The conference’s player of the year, Brady is a big reason why the Ramblers are 30-2 against SHL opponents and the favorite to the win their first state championship since 1996. Looking back, Brady said not making JV was the best thing for him. He ended up playing club hockey for the Highland Park Falcons. Loyola Gold is the top seed at the AHAI Blackhawk Cup Red Division state tournament and plays St. Ignatius on Tuesday in the quarterfinals at The Edge in Bensenville. Brady started in the Ramblers’ 6-0 win over Sandburg in the first round and their 4-0 victory over Carmel in the second round. Although Brady was cut freshman year, Loyola Gold goalie coach Stu Gould said he saw Brady’s potential. From Chicago’s Edgebrook neighborhood and graduate of Queen of All Saints, Brady started playing hockey at a young age. He said he was drawn to the goalie position after seeing the gear at a sporting goods store. Brady played goalie on Loyola Maroon as a sophomore and junior. He helped the Ramblers win the state title in the AHAI Blackhawk Cup White Division last season. Gould, who coached NHL goalie Al Montoya as a freshman at Loyola, said Brady’s best qualities are his confidence and focus. It doesn’t hurt that Brady is 6-foot-2 and a good skater. According to LaVarre, another strength of Brady’s is how he controls his emotions in big games. Brady is 3-1 against two-time defending state champion New Trier Green, the lone loss a 2-1 defeat in overtime. One of Brady’s highlights so far was when he started in the Ramblers’ 4-2 win over New Trier Green on Oct. 25 at the Winnetka Ice Arena. The second game between the Ramblers and Trevians in the best-of-three series will be Saturday at Winnetka Ice Arena. "Stu's News" brings you our archive of highlights, announcements, and articles. Images are Click to Enlarge.